What is the purpose of #CripTheVote? 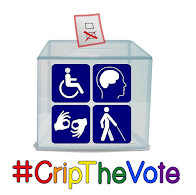 #CripTheVote is a nonpartisan campaign to engage both voters and politicians in a productive discussion about disability issues in the United States, with the hope that Disability takes on greater prominence within the American political landscape. We hope to encourage people with disabilities to engage with elections at all levels from President on down, and to vote. We also want candidates to engage with disability policy issues and disabled people as much as possible. What is "CripTheVote" supposed to mean? Basically, it is a catchy way of referring to the idea of disabled people being active voters and through their collective power, forcing important disability issues into the mainstream. Why do you use the word "Crip"? Isn't that offensive? We realize the word "Crip" isn't for everyone, but we chose it for several reasons. Read more about that here. What can I do if I don’t use Twitter? You don't need a Twitter account if you want to follow the conversation happening in real-time. At any time, you can check this link. This link will show all the tweets that use the CripTheVote hashtag and you can scroll up and down to read all the comments. A Twitter Chat is a public discussion that uses a hashtag as a virtual meeting point on Twitter. A hashtag is a way of making tweets more easily searchable. By using the hashtag (in this case #CripTheVote) one can find all of the tweets on a particular subject in one place by either clicking on the hashtag or using twitter’s search function. For an example of what a Twitter chat looks like, check out this example by Ruti Regan. It’s very helpful explaining the elements of a typical Twitter chat. What if I can't keep up with the questions during a Twitter chat? It's fine to tweet at your own pace. We post our questions in advance in case folks want to prepare. Also, we don't expect folks to have to keep up. Our questions are spaced 4-5 minutes in advance but people can reply at their own leisure. There's no wrong way to participate in a chat. You're welcome to tweet before, during and after the scheduled time. We also suggest you read this guide to using Twitter for discussions and advocacy. 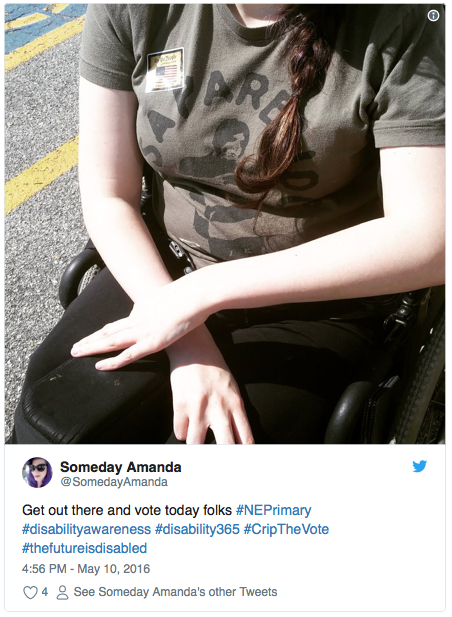 What does posting Twitter comments with the #CripTheVote hashtag accomplish? The way Twitter hashtags work, individual participation collects all of our comments and ideas into a noticeable voice with a chance of being noticed outside the already engaged disability activist community. It’s also a convenient way to get us all talking and sharing ideas amongst ourselves. In a more concrete way, it could prompt candidates and political reporters engage publicly with specific disability-related questions. If enough people are using a particular hashtag at a given time, Twitter will identify it as trending which garners even more attention from both the media and other Twitter users. When should I use the #CripTheVote hashtag? Include it in tweets about elections, voting, and issues at any level, if it is also in some way related to disability. That could mean comments about particular candidate or political party platform positions on disability issues, candidates’ rhetoric and behavior towards disabled people, questions disabled voters want to ask candidates, policy proposals and bills that would affect disabled people, and ideas for encouraging candidates and journalists to engage with disability issues and disabled voters. May I argue for my favorite candidate under the #CripTheVote hashtag? Sure! This effort is non-partisan. We aren’t going to endorse candidates or try to make one look better than the others, but that doesn’t mean you have to keep your own preferences secret. Feel free to make your case. Just remember that we want to keep this these discussions respectful and broadly focused on disability-related issues and voting by disabled people. So, if you are going to publicize a candidate, make sure to explain the relevance to disability issues, such as the candidate’s record or positions on disability policy questions. Why focus on voting by disabled people? Americans with disabilities could become a very powerful constituency of voters. But currently, we are punching below our weight. While over 16 million people with disabilities voted in the 2016 elections, voter turnout rate of people with disabilities was 6 percentage points lower than that of people without disabilities. Meanwhile, the voter registration rate of people with disabilities was 2 percentage points lower than that of people without disabilities. That is a lot of untapped political power. (Fact sheet: Disability and Voter Turnout in the 2016 Elections Lisa Schur and Douglas Kruse, Rutgers University). What actually happens, and when? The signature activity of #CripTheVote is Twitter Chats on topics related both to elections, and to specific disability policy issues. However, people contribute comments, information, questions, and links to articles on disability issues every day under the #CripTheVote hashtag. Every day there’s something to read, and all are invited to contribute to the ongoing #CripTheVote discussion of disability, politics, policy, identity, and voting. How do I announce a disability issue activism event or initiative? All you need to do is compose a tweet with the event or initiative's particulars, including its goals and what people can do to help, and include in the tweet #CripTheVote. You don't need permission, and you can do it yourself at any time. Just make sure the event is broadly consistent with the theme of disability issues, activism, and politics. A great way to squeeze more detailed information and background material into a single tweet is to post it all on a webpage with a web address, and simply include the web address in your tweet. Viewers can then click on the link and see your information on a webpage in their browser. Alice Wong, Andrew Pulrang, or Gregg Beratan. #CripTheVote is an online campaign that uses Twitter to have conversations about voting and disability issues. We also have blog posts and a Facebook group where we publish information about our upcoming events and news. Social media is term that’s used a lot–you might hear about Facebook, YouTube, Snapchat, Instagram as examples. Broadly speaking, social media are websites or apps that allow users to post information (text, photos, audio) and share it to the public or within a specific network of friends/colleagues. This article will give a describe the pros and cons of using a social media platform such as Twitter and how to get started for first-time users. 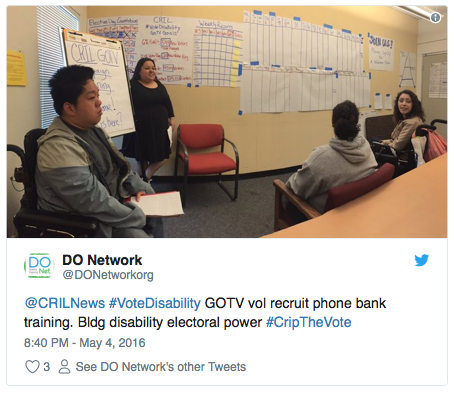 Why does #CripTheVote use Social Media? We understand that our campaign will not reach everyone, but there are many other campaigns that are not online with similar goals. There’s something for everyone and there’s no wrong way to be an advocate. You don’t need a Twitter account if you want to follow the conversation happening in real-time. At any time, you can check this link: http://twubs.com/CripTheVote. This link will show all the tweets that use the CripTheVote hashtag and you can scroll up and down to read all the comments. Read the various tweets people are sharing. You can Read ‘Top’ tweets that are most popular and shared. ‘Live’ tweets show the most recent ones, and other tabs that with News, Photos, and Videos. Your mission, if you choose to accept it, is to tweet a photo or message using the #CripTheVote hashtag. Totally up to you, but it might be a fun first-step in connecting with people with disabilities who are interested in voting and current events. 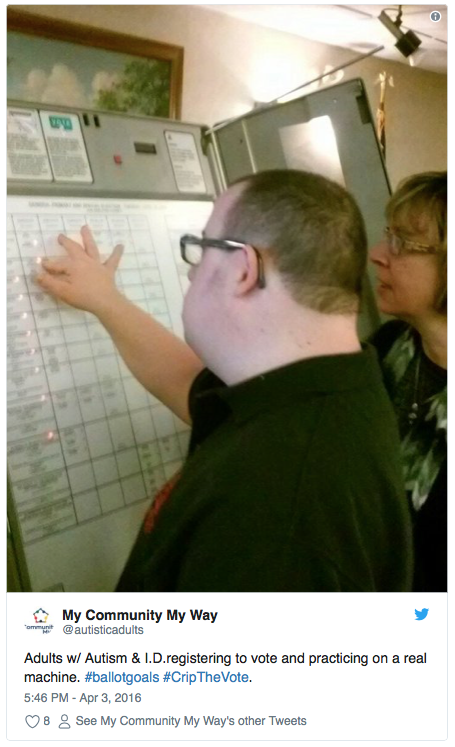 Visibility of people with disabilities is important. Selfies/photos are a wonderful way to share a brief message and say, “Hey, I’m here and this is what matters to me!” Saying who you are and what you care about is a form of advocacy that can lead to a broader community. Photos or short videos can make powerful statements. If you’re at the Voting Summit, feel free to complete the sentence, “I vote because…” and take a photo of you with a sign that will be available at the event (or use any piece of paper). Tweet Your Photo with a Message! This is a step-by-step for iPhone users. It might be different for Android or other phones. Screenshot of an iPhone’s photo app with one image selected among a row of other photos. Below are options to share the image on various apps, via text, email and other sites. Step 3: Below your selected photo, you can see the options you have for sharing your photo. Swipe left or right until you see the Twitter icon and select it. Screenshot of an iPhone’s photo app with one image selected among a row of other photos. Below are options to share the image on various apps, including Twitter. Step 5: After you type your message, click ‘Post’ on the upper right-hand corner of the window. Below is an example of Alice’s photo. She typed the same message on her sign so it’s accessible to all users. When you type your message, sometimes you’ll see different hashtags that match the one you’re about to type. For example, when Alice started typing the hashtag, #CripTheVote appeared in a list. You can select it without typing the whole thing. Screenshot of a window with a Tweet that says, “I Vote because…the Medicaid poverty trap needs to end. 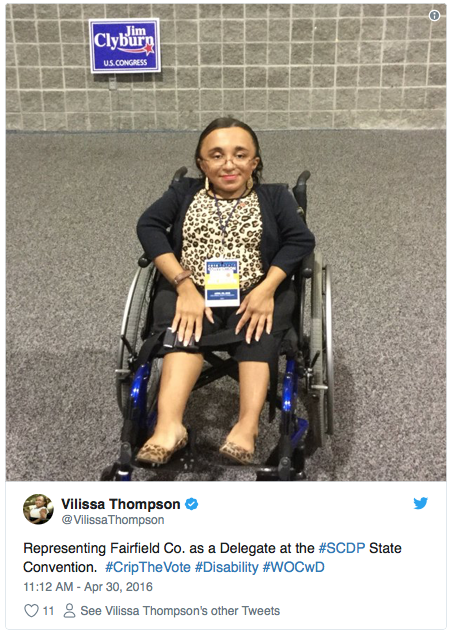 #CripTheVote” Next to it is a photo attached w/ the image of an Asian American woman in a wheelchair holding a white piece of paper with the same message. Step 7: After clicking “Post,” open your Twitter app on your phone. Screenshot of an iPhone with a six rows of various icons indicating apps and other functions of a smartphone. Step 8: This is what it looks like from Alice’s Twitter account. Now it is public for all to see. If you click on the tweet, you can see the entire image. Screenshot of a Twitter app that’s open showing a tweet by Alice Wong, @SFdirewolf Screenshot of a window with text written that says “I vote because the #Medicaid poverty trap needs to end #CripTheVote” Including an photo of her holding a sign with the same text. If you’re more into Instagram, you can do the same thing and share on Facebook or Flickr at the same time. The steps are similar–just follow these step-by-step images. Screenshot of an Instagram app for Alice Wong, @alicatsamurai. Below are small images of her instagram images. Step 2: Select the middle button in blue at the bottom of the screen. Select an image from your photo library (from your phone). Step 3: Type your caption. Instagram is great because you can write longer messages. Don’t forget the hashtag!! You can tag your friends on Instagram or post the same image and caption to other social media sites connected that you might use such as Facebook, Twitter, Tumblr. Note: I don’t select Twitter when I use Instagram because the image doesn’t appear on Twitter, just a link back to Instagram. Instagram window that says, Share To. Below is the image, the caption, and several options of tagging people, adding location, and posting directly to Facebook, Twitter, Tumblr, or Flicker. Below is a Share button. Here’s the same message I tweeted on Twitter, but this time on Instagram using the same hashtag. No matter what social media site you use, people can find similar posts on under this keyword. 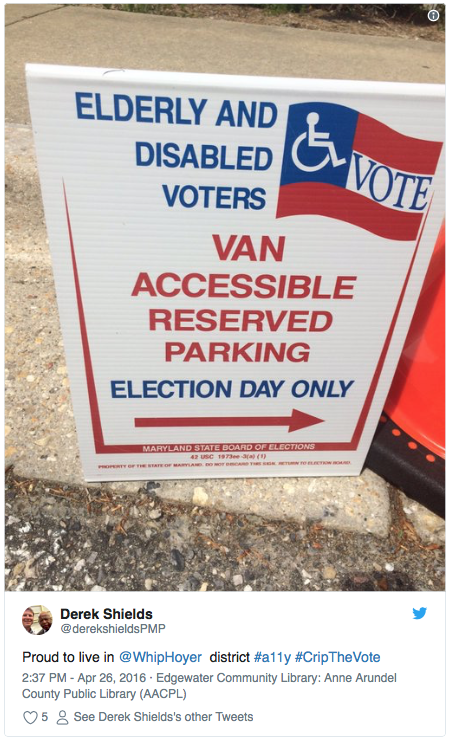 Screenshot of a recent Instagram post by user alicatsamurai showing a photo of an Asian American woman in a wheelchair holding a white piece of paper that says, “I Vote because…the Medicaid poverty trap needs to end.” The caption below the message has the same text in the sign. Have fun with social media if you already use it or are interested in trying it! There’s no wrong way to do it and you’ll get the hang of it eventually. If you’re shy, you can post message without a photo. It’s up to you how much you want to reveal. You are in control.